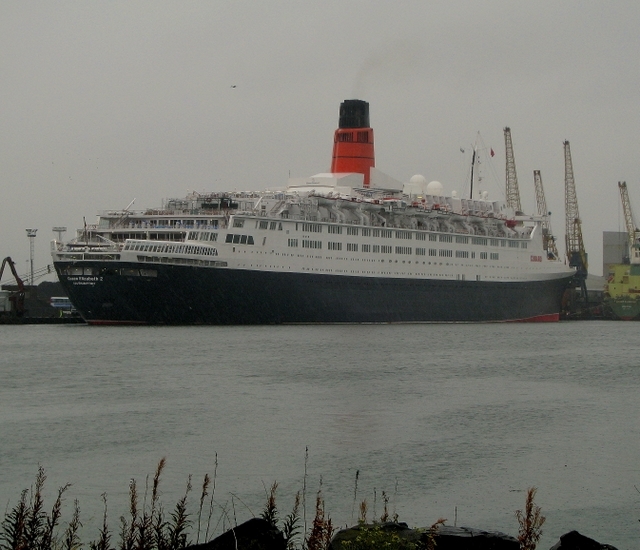 The 'QE2' at Belfast, calling to the port as part of her farewell tour prior to being withdrawn from service. Her final voyage will be from Southampton to Dubai, leaving on 11 November 2008. After arrival, she will be refurbished and berthed permanently at the Palm Jumeirah from 2009 as "a luxury floating hotel, retail, museum and entertainment destination." The 'QE2' was built by the Upper Clyde Shipbuilders in the John Brown Shipyard in Clydebank, Scotland. Her keel was laid down on 5 July 1965, as hull number 736, and was launched and named on 20 September 1967 by Queen Elizabeth II. She was flagship of the Cunard line from 1969 until succeeded by RMS 'Queen Mary 2' in 2004. The 'QE2' weighs in at 70,327gt, is 293.5m in length and has a maximum capacity for 1,892 passengers and 1,015 officers and crew. See Link for some related images.